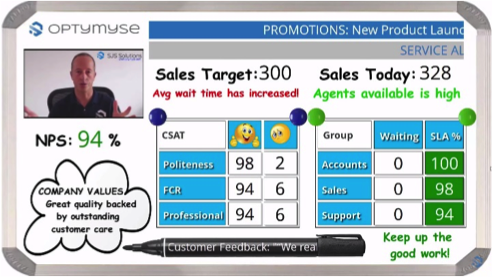 Optymyse Engagement Wallboards – The New way to Excite, Motivate and Encourage your contact centre agents! Refrain from displaying dull and numeric call handling metrics on your wallboards, instead share new content, new metrics and create positive designs, focusing on the happiness and well being of your agents. 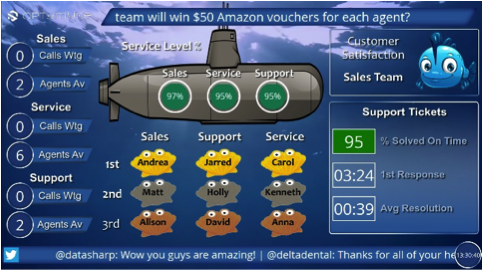 Unlike traditional wallboard designs, Optymyse templates have been specifically designed to promote higher levels of employee engagement and customer satisfaction by creating the perfect mix of recognition, competition, knowledge and social inclusion. How to get information into Wallboard? Optymse REST API which gives the freedom to create specific connectors. 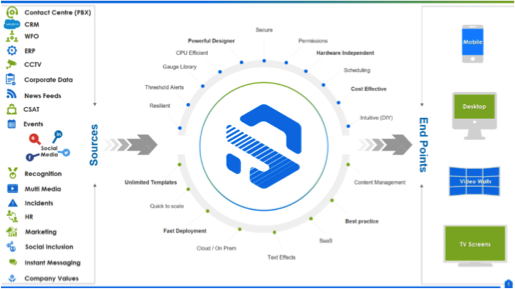 Alternatively, there is a rich options of readily available connectors into commonly used systems like AVAYA CMS, CISCO Unified Contact Centre Express (UCCX). Let us know what systems you are using, we will make it work!